Tablet mode makes every application (including Start Menu) run in full screen, which provides a more touch-friendly experience. 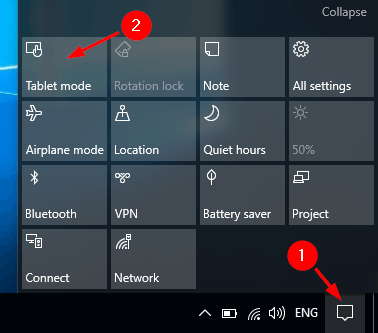 If you have a 2-in-1 tablet, Windows 10 asks you if you want to enter tablet mode when you detach a tablet from its base or dock. 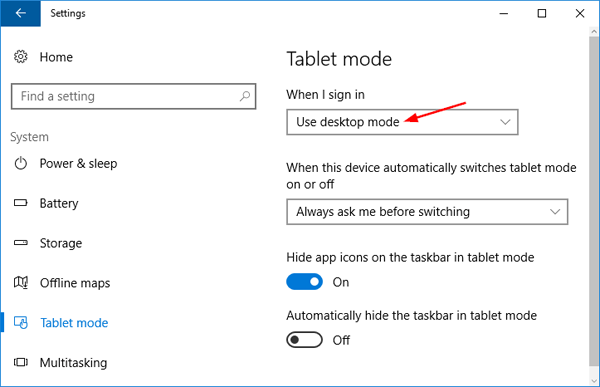 In this tutorial we’ll show you 3 simple ways to turn on / off tablet mode, switch between tablet mode and desktop mode in Windows 10. 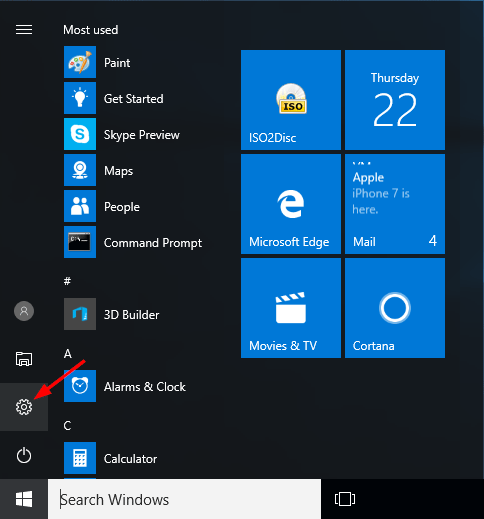 Click on the Action Center icon in the taskbar notification area. At the bottom of the Action Center, click on the Tablet mode button to toggle it on (blue) or off (gray) for what you want. 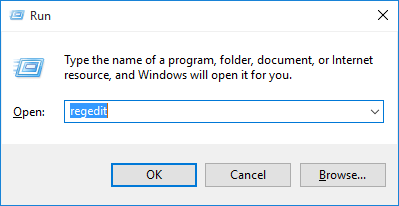 To open the PC Settings, click the Settings icon from the Start Menu, or press the Windows + I hotkey. click on Tablet mode in the left-hand navigation pane. 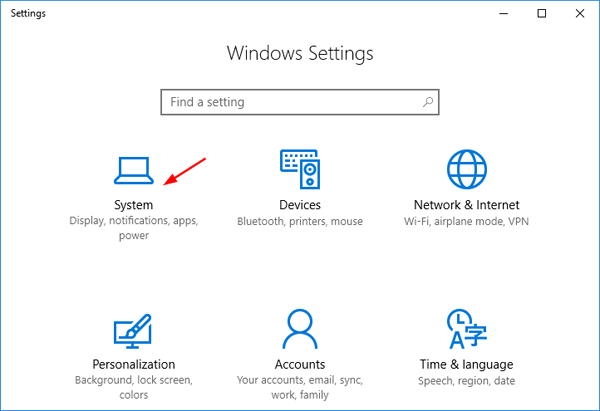 Under the When I sign in option, select Use desktop mode if you want to disable tablet mode, or select Use tablet mode to turn on it. 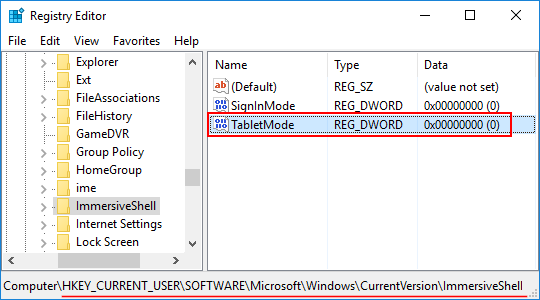 If you’re running an old build of Windows 10, toggle “Make Windows more friendly when using your device as a tablet” to on to enable tablet mode. Toggle it off to use desktop mode. In the right pane, you should see a DWORD value named TabletMode. 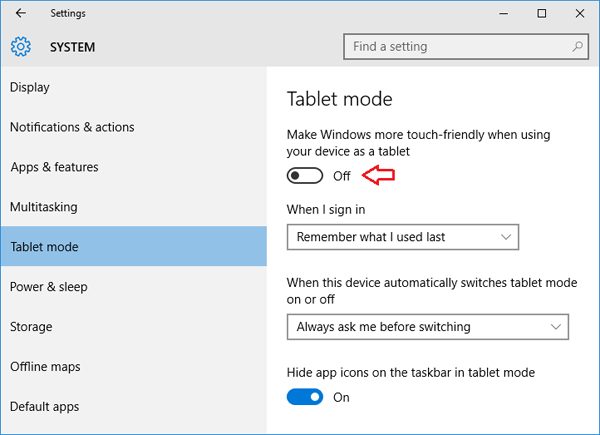 In order to turn off tablet mode, double-click on TabletMode and set it to 0. Or set it to 1 if you want to turn on tablet mode. Restart your computer for your changes to take effect.